When we moved into our home, the laundry room housed a big industrial cast-iron sink on a metal stand. 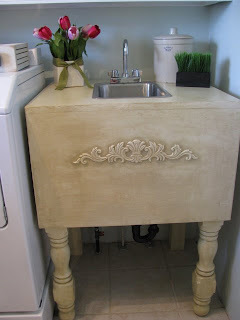 Now I know that many women would be thrilled to have a big ol' sink in their laundry room, and honestly, I can appreciate the industrial look, but this thing was hideous!!! It would be great out in a garage for washing automotive parts and greasy hands (we actually saved it with that in mind) but, I wanted my laundry room to look nice, not like an auto shop. I've been known to make unpleasant looking things look good, but even if I put a gorgeous skirt on this sink to hide the metal legs, it would still look like a really ugly cross-dresser. So there was only one alternative---Remove and Replace! We found a nice, little but deep, stainless steel sink still in it's original cabinet at the thrift store. There was only one problem. When we placed the cabinet next to the tall washer and dryer it looked like a shrimp in a sea of whales. So I began to dream up a design. I was inspired by the look of old, thick butcher block tables. We had the leftover table top from this project, so we only needed to buy a small amount of wood. I had two used stair newel posts, in my supply of "stuff", that we turned upside-down for the front legs. We added a decorative piece to the front. I painted, glazed, and polyed. And now we have a sink that's original, pretty (can you call a sink pretty?) and it holds it's own next to the tall washer and dryer. That looks so nice! Adn the accessories you've got on top add the perfect touch! I'm always so envious seeing pictures of nice laundry rooms. I bet it makes laundry so much more enjoyable! I just have a big laundry closet, right in my kitchen, with big bi-fold doors. It also holds the water heater. I can't think of any ideas for making a water heater pretty! All I can say is WOW, it is a beauty. I am envious of anyone with a laundry room. As I was reading your post, I couldn't wrap my head around what you were describing until I saw the picture. Then "click" I got it (the old butcher block table look). I must be slow this morning. Anyways, it turned out great and it must be handy to have a sink in the room. Very cute. I just purchased some resin appliques for the table and bread box I'm working on. I was surprised by how flimsy they were. Do the handle well once they are attached and painted? BTW I think you may have given me an idea for my laundry room. Thanks for stopping by my blog. It's so great too meet other new-ish bloggers. I love your blog! I'll definitely be back to read more. Your sink is fantastic! What a wonderful idea! I have one of those old monsters in my laundry room now and a fix-up like you did would be great in there! That is the most amazing sink I have ever seen!